See Matching Swimming Plaques Below! Hex Style 11 1/2" x 9 1/2"
Pentagon Style 10" x 8 1/2"
Tombstone Style 10" x 8 1/2"
Swimming 3-D Oval Resin Trophies - Stand or Hang! Large Swimming Plate Resin Trophies - Stand or Hang! #RFC-995 Swim - Approximately 6 1/2"
Elegant Heavy Resin w/Swimming Holographic Mylar. On Beautiful Piano Finish Resin Base! 9 Reward Points Earned. Click Here for Details. Gameball Trophies Male Swimming Confetti Sport Globe. The kids Are Going To Love Them! Gameball Trophies Female Swimming Confetti Sport Globe. #54312GS - Approximately 8" x 8 1/2"
Swimming Male Heavy Resin Casting Oval. Gift Boxed & Hand Painted. Hang It On The Wall or Stand It On A Desk/Shelf For Display. Choose From 12 Different Engraving Plate Colors. Up To 4 Lines Of Engraving. 10 Reward Points Earned. Click Here for Details. #54313GS - Approximately 8" x 8 1/2"
Swimming Female Heavy Resin Casting Oval. Gift Boxed & Hand Painted. Hang It On The Wall or Stand It On A Desk/Shelf For Display. Choose From 12 Different Engraving Plate Colors. Up To 4 Lines Of Engraving. 10 Reward Points Earned. Click Here for Details. #56312GS - Approximately 6 1/2" x 6"
Swimming Male Heavy Resin Casting Oval. Gift Boxed & Hand Painted. Hang It On The Wall or Stand It On A Desk/Shelf For Display. Choose From 12 Different Engraving Plate Colors. Up To 4 Lines Of Engraving. 9 Reward Points Earned. Click Here for Details. #56313GS - Approximately 6 1/2" x 6"
Swimming Female Heavy Resin Casting Oval. Gift Boxed & Hand Painted. Hang It On The Wall or Stand It On A Desk/Shelf For Display.Choose From 12 Different Engraving Plate Colors. Up To 4 Lines Of Engraving. 9 Reward Points Earned. Click Here for Details. #RFH538 - Approximately 7 1/2"
Heavy 3-D Male Resin Figure w/Bronze Finish. Choose From 12 Different Engraving Plate Colors. Up To 3 Lines Of Engraving. 9 Reward Points Earned. Click Here for Details. #RFH539 - Approximately 7 1/2"
Heavy 3-D Female Resin Figure w/Bronze Finish. Choose From 12 Different Engraving Plate Colors. Up To 3 Lines Of Engraving. 9 Reward Points Earned. Click Here for Details. Swimming Pewter Resin Sculpture w/Gold Wreath. Choose From 12 Different Engraving Plate Colors. Up To 3 Lines Of Engraving. 5 Reward Points Earned. Click Here for Details. #50053GS Swim - Approximately 5"
Blue Ribbon Resin w/Swimming Holographic Mylar. Choose From 12 Different Engraving Plate Colors. Up To 4 Lines Of Engraving. 6 Reward Points Earned. Click Here for Details. #RHI610SG Swim - Approximately 6 1/4"
"Z" Slant Resin Sculpture w/Swimming Holographic Mylar. Choose From 12 Different Engraving Plate Colors. Up To 4 Lines Of Engraving. 7 Reward Points Earned. Click Here for Details. #RHI510SG Swim - Approximately 5 1/4"
"Z" Slant Resin Sculpture w/Swimming Holographic Mylar. Choose From 12 Different Engraving Plate Colors. Up To 4 Lines Of Engraving. 6 Reward Points Earned. Click Here for Details. #R652 Swim - Approximately 6 1/4"
All-Star Resin Figure w/Swimming Holographic Mylar. Choose From 12 Different Engraving Plate Colors. Up To 3 Lines Of Engraving. 8 Reward Points Earned. Click Here for Details. #5051-T Swim - Approximately 5 1/2"
Clear Ribbon Figure w/Swimming Mylar. Genuine Black Marble Base. Choose From 12 Different Engraving Plate Colors. Up To 3 Lines Of Engraving. 7 Reward Points Earned. Click Here for Details. #R665 - Approximately 6 1/4"
Swimming All Star Resin Figure. Choose From 12 Different Engraving Plate Colors. Up To 3 Lines Of Engraving. 7 Reward Points Earned. Click Here for Details. #R615 - Approximately 4 1/4"
Swimming All Star Resin Figure. Choose From 12 Different Engraving Plate Colors. Up To 3 Lines Of Engraving. 4 Reward Points Earned. Click Here for Details. Swimming Signature Resin Figurine. Choose From 12 Different Engraving Plate Colors. Up To 3 Lines Of Engraving. 6 Reward Points Earned. Click Here for Details. #JDS83 - Approximately 4 1/2"
Swimming Resin Award w/Antique Gold Wreath. Choose From 12 Different Engraving Plate Colors. Up To 3 Lines Of Engraving. 6 Reward Points Earned. Click Here for Details. Male Bobble Head w/Gold Accents & Bobbing Head. Choose From 12 Different Engraving Plate Colors. Up To 3 Lines Of Engraving. 6 Reward Points Earned. Click Here for Details. Female Bobble Head w/Gold Accents & Bobbing Head. Choose From 12 Different Engraving Plate Colors. Up To 3 Lines Of Engraving. 6 Reward Points Earned. Click Here for Details. #52312GS - Approximately 5 1/2"
Male Bobble Head w/Gold Accents & Bobbing Head. Choose From 12 Different Engraving Plate Colors. Up To 3 Lines Of Engraving. 7 Reward Points Earned. Click Here for Details. #52313GS - Approximately 5 1/2"
Female Bobble Head w/Gold Accents & Bobbing Head. Choose From 12 Different Engraving Plate Colors. Up To 3 Lines Of Engraving. 7 Reward Points Earned. Click Here for Details. #50052-G Swim - Approximately 4 1/2"
Gold Wreath w/Swimming Holographic Mylar. Choose From 12 Different Engraving Plate Colors. Up To 4 Lines Of Engraving. 6 Reward Points Earned. Click Here for Details. #50052-S Swim - Approximately 4 1/2"
Silver Wreath w/Swimming Holographic Mylar. Choose From 12 Different Engraving Plate Colors. Up To 4 Lines Of Engraving. 6 Reward Points Earned. Click Here for Details. #53100GS Swim - Approximately 5"
Ribbon Resin w/Swimming Holographic Mylar. Choose From 12 Different Engraving Plate Colors. Up To 4 Lines Of Engraving. 7 Reward Points Earned. Click Here for Details. "Z" Series Slant Resin Sculpture. Choose From 12 Different Engraving Plate Colors. Up To 5 Lines Of Engraving. 6 Reward Points Earned. Click Here for Details. Medal Presentation Box Holds 2 1/4" Medals. Add A Touch Of Class With Our Medal Presentation Box. Medal Not Included. 1 Reward Points Earned. Click Here for Details. 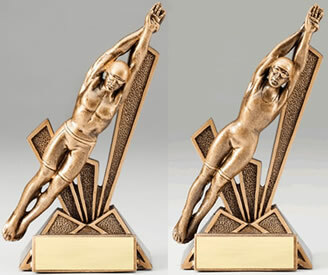 #RFC-896 Swimming - Approximately 6 1/4"
Gameball Trophies Elegant Heavy Swimming Spin Medal Riser. Mounted On Beautiful Piano Finish Resin Base!